Breakfast is the one meal I have a hard time getting in. I am generally so focused on just getting my coffee, and then the kids’ breakfast that I often forget to make something for myself. Or I just run out of time. Can anyone else relate? 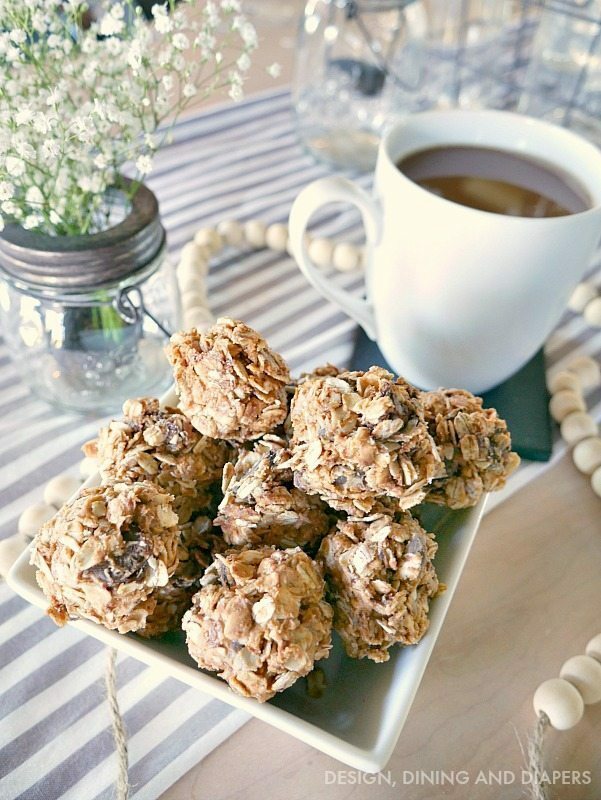 I need something that I can grab and go so I whipped up a batch of these No Bake Breakfast Bites with Oatmeal, Peanut Butter and Chocolate Chips. Sooo delicious and even the kids loved them! 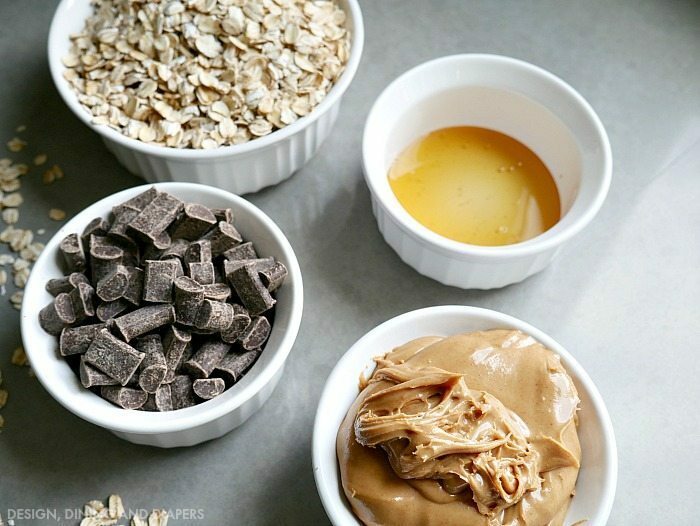 Here is the quick recipe: 1) 2 Cups of Oatmeal 2) 1 Cup Chocolate Chips 3) 1/4 Cup of Honey 4) 1 1/2 Cups of Peanut Butter. 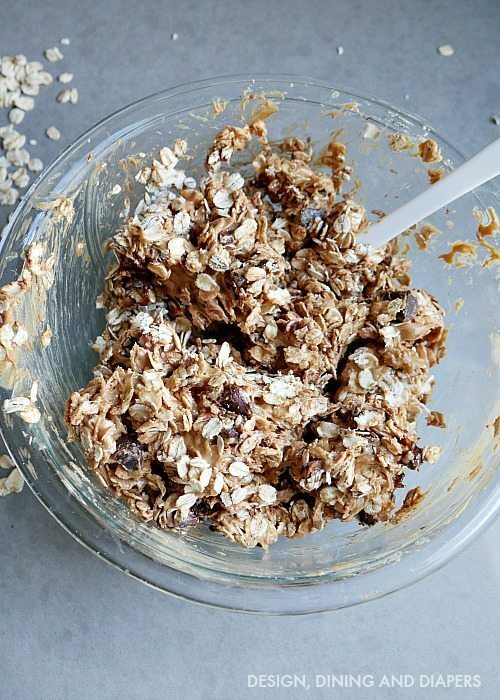 Dump all the ingredients into a bowl and then microwave for 30 seconds. This softens the chocolate and peanut butter just enough so it makes it easier to stir. Roll the dough into balls and place on a tray lined with parchment paper. Place in the refridgerator for 30 minutes and then serve. Ready to start my day. How about you? Taryn, theses look awesome and easy! So you have the calories and nutritional information available.? These look so good! I am definitely going to make some soon. Thank you for sharing the recipe! Taryn! How easy and seemingly good for us! I would also love the calorie and nutrition info! Thanks sooo much ~ I’m excited to make these, since I actually have everything on hand! Hi Heather! You don’t necessarily HAVE to refrigerate them, but I typically put them into a bowl and keep them in the fridge to stay cold and more firm. Otherwise they may soften up quite a bit. What an easy and healthy recipe! Would you have the nutritional information per bite? Taryn, This looks easy a great tasting, I too would like to know the nutritional information. Especially, the carbs and what a serving size would be. ( 1, 2, pieces per serving?) 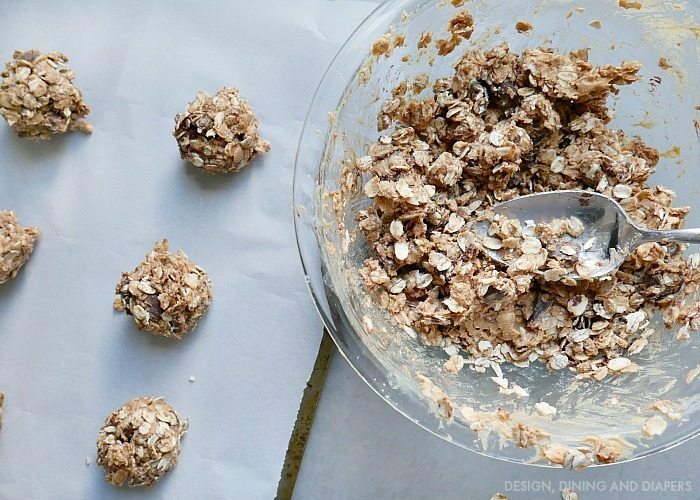 Do you suggest using Quick (1 minute) or old faction oats? Hi! Unfortunately I don’t have the nutritional info broken down.